The delivery of emergency medical services in the Commonwealth of Massachusetts is regulated by the Massachusetts Department of Public Health (DPH) Office of Emergency Medical Services. M.G.L. Chapter 111c, the enabling legislation, empowers DPH to create and enforce the Commonwealth's EMS regulations, 105 CMR 170.000. Amongst the requirements outlined in those regulations is the designation of Regional EMS (emergency medical services) Councils. The Metropolitan Boston Emergency Medical Services Council, Inc. (MBEMSC), EMS Region IV, is the agency designated by the DPH to coordinate the delivery of emergency medical services, as defined by 105 CMR 170.100 - 170.106, within the sixty-one cities and towns comprising the Metropolitan Boston Area. The Council coordinates, maintains and improves the EMS system within those sixty-one communities; oversees EMS activities focusing on quality patient care; reviews and recommends continuing education programs for ambulance service providers; provides information and educational resources to the public; coordinates the Metro Boston CMED radio and communication system; and assists in statewide EMS treatment protocol development, as well as disaster response and communications. The Region, which extends north as far as Wilmington and Littleton, west as far as Marlborough and Hopkinton, and south as far as Wrentham and Hanover, serves as residence to over 2 million people, and accounts for close to 1 million emergency department visits in the Region's hospitals each year. EMS Region IV is one of five Massachusetts Regional Emergency Medical Services (EMS) councils (EMS Region IV). 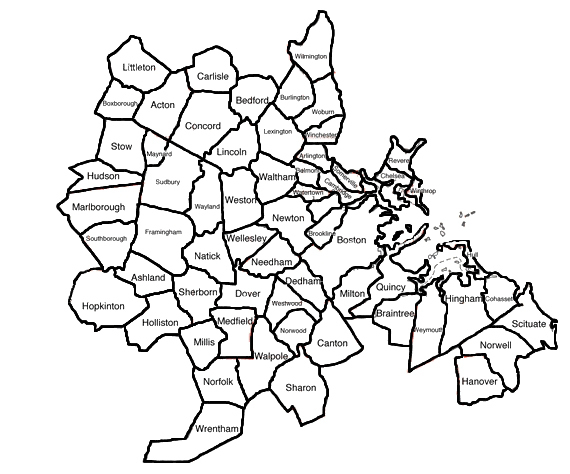 The council is governed by a Board of Directors consisting of local and state government officials, emergency medical technicians (EMTs), nurses, doctors, ambulance service providers, fire, police, hospitals, and citizens representing the 61 communities of Metropolitan Boston and the surrounding area.